I have a fairly robust obsession with winter squash. Butternut, kabocha, acorn, delicata: you name it, I dig it. At this time of year, it’s hard for me not to infuse anything and everything with these beta-carotene packed, sweet, hearty, and delicious root vegetables (or with sweet potatoes, which are similar). 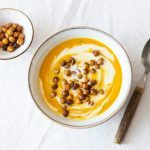 Not surprisingly, most of the soup recipes I turn to right now feature orange-fleshed vegetable friends: my roasted kabocha and pear bisque, for example, or my African yam and peanut stew with kale. 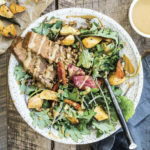 But a person can’t live on winter squash and sweet potatoes alone, and lately I’ve been trying to think outside of the soup box, featuring other root vegetables and bases. 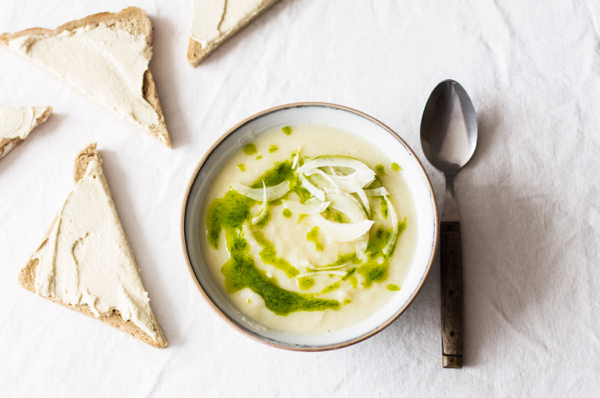 This cream of celeriac and fennel soup emerged from that initiative, and it’s a new favorite. This recipe rests on the interesting contrast of peppery, tangy celery root (which, if you’re not familiar, tastes like celery, though the texture is very different), and sweet fennel. The texture is creamy and smooth. I made this soup for friends recently, garnishing it with cashew cream and a drizzle of chive oil. They absolutely loved it, which was a relief: at first, I wondered if celeriac was too distinctive a flavor to use as the soup base. 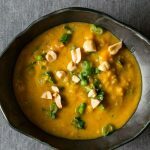 There was no reason to fear: the soup is a crowd pleaser, worth making for dinner parties or simply for warming yourself up on a cold night. If you can’t get your hands on a knobby head or two of celery root, then try using rutabaga here instead. The taste will be a little less vibrant, but still really flavorful. 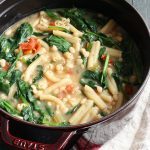 In a large soup pot or Dutch oven, heat the olive oil over medium heat. Add the onion and sautee until it's clear and soft (about 5-7 minutes). Add the garlic, reduce heat slightly, and sautee it for another minute or two. Add the celery root and fennel and cook for 5-8 minutes, or until the vegetables are becoming soft and the fennel is slightly clear. Add the vegetable broth and salt, and bring the mixture to a boil. Lower it to a simmer, and simmer the vegetables for 15-20 minutes, or until they're very tender. Transfer the soup to a blender in batches to puree it, or use an immersion blender. Return it to the pot to keep it warm, and serve with a drizzle of cashew cream and chive oil (recipe below), if desired. To prepare chive oil: Place the chives and oil into a food processor or blender, and blend until the mixture is even, but still has some texture. Serve over soup, salad, or as a drizzle over tartines. Hope you enjoy it. Have a wonderful Friday, friends — I’ll be back tomorrow to share a special raw holiday cookie recipe! Hi gena yum, sounds great another great recipe! 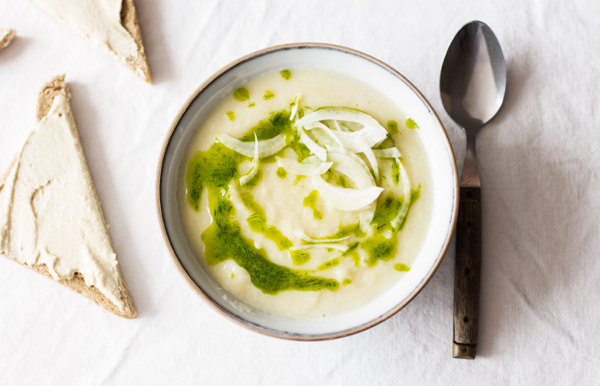 Also really good is the soup combo celeriac parsnip apple onion garlic and topped with a parsley infused olive oil. It’s lovely ! Oh my gosh, this looks divine– simple and totally doable, yet farm- to- table elegant 🙂 And chive infused oil? Say what?! Yum. what a beautiful bowl of soup!